I have no idea what inspired me to make a big pot of homemade gumbo this evening. The short answer is: I was craving it. But I don’t know why, because I have zero ties to New Orleans. In fact, Louisiana is one of the few states I have never visited. It’s not like my mom cooked gumbo every Sunday while I was growing up. Or ever. It’s just one of those dishes that I feel like making every couple of years, usually after enough time has passed that I forget how time-consuming the whole process is. It’s all about the roux. Making it takes patience and an unerring commitment to stirring constantly for at least 45 minutes. The recipe I was using today told me it’d be done after 20 minutes, but THEY LIED. I have never had a good roux take less than three quarters of an hour, and today was no exception. I remember once it took me 90 nonstop minutes. I’m kinda surprised I didn’t end up with a torn rotator cuff that time. Cooking can be dangerous, kids. FWIW, the gumbo turned out delicious. Which means I’ll be ready to make it again in another 24 to 36 months. Gumbo is a dish I make at least once a year, usually when the weather gets cooler. You’re right, it’s all about the roux. It’s definitely a cold weather dish! I bet yours is delicious. It’s world famous, Mr. Petruska, like my much requested chicken and dumplings which I will be preparing next week for a friend’s birthday. Yeah, I made a cheesy garlic spaghetti squash last night that recipe said took 40-50 minutes in the oven. NOT! Mmm. Was it worth the effort? Sure sounds good! Mark, can you believe that I’ve NEVER had Gumbo?!? But it looks (judging from your photo) DE-licious! No, Ron. 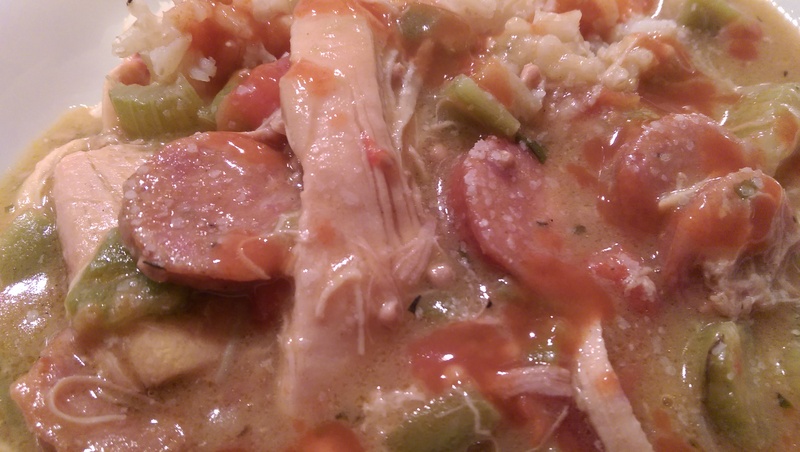 I cannot believe you have never had gumbo. I’m sure in a melting pot like NYC you can find a great Southern restaurant or two that can fix that!